Most of the other reviews have hit the major pros and cons with this, but there are still a few more that I can add. Hope they help in making your purchasing decisions! - Thanks to the gyro, very short learning curve. Remote has two joysticks. Left side only moves up/down and controls speed of the rotors, which controls how much lift they generate. Right joystick moves up/down (controlling forward/reverse) and left/right (makes heli spin). You can also moving the right stick diagonally to make various turns while moving forward or backwards (reverse “figure-8’s” are always impressive). - Surprisingly large number of “mods” that can be done to a $30 heli. After experimenting, I have settled on two minor ones. First, I removed the spring from the left joystick in the controller. This lets me put the heli in a hover and let go of the remote (“look ma, no hands!”). I have also moved the landing gear forward in their mounts to push the center of gravity forward a little, which gives a tiny bit more forward speed. (Some people tape a paperclip to the front to achieve the same effect). One of the other big ones that I tried, but didn’t keep, was the “flybar mod”. Google it for more details. - Very durable. Before flying the S107, I had a non-gyro 3-CH heli which broke after it’s third flight. I’m now 2+ weeks into the S107 and despite crashing into just about everything possible: walls, ceiling, sofa, tables, pull chain for ceiling fan, the Christmas tree(! ), but for some minor nicks on the blades that don’t affect flight, everything has held up fine. [My “trick” is to cut power to the blades completely as soon as the crash occurs, and just let it fall]. Even if something does break, just about every part on the 107 is replaceable, from the wings to the motors to the body parts. - Because the S107 is so light (>40g), it absolutely cannot be used in any sort of wind. In fact, a decent draft can be enough to cause it to blow off course. Even indoors, you have to avoid open windows and fans of any sort. Not really a big problem as this happens to all small indoor helis. - Due to IR control, people report having issues flying near/around LCD televisions and light bulbs that are on when flying. I can fly over lit lamps (incandescent and florescent) without issues, but my 46″ LCD will occasionally cause the heli to lose contact with the controller, shutting down power to the rotor. Turning off the TV solves the problem completely. - The power connector inside my controller will not charge my heli – after five seconds, it thinks its fully charged and shuts down. After taking the controller apart to look for issues, I found the the power wires’ connection to the controller board were not soldered properly. Since the USB charger works fine, I did not bother returning the heli, but quality control still seems to be an issue. - Although the controller has markings for 3 channels (A, B and C), advertised as being able to have three people fly their S107s in the same room, there are actually only *two* channels available. (Again, I have taken the controller apart to verify this). So if you planned on giving this as a gift to your 3 children, keep in mind only two will be able to play with it simultaneously. On the bright side is that to change channels, you just have to flip the switch on the controller and the heli will automatically recognize which one you chose. All in all, the positives far outweigh the negatives and this makes a great toy for kids and adults alike. RATING: After flying the 7.5 inch Syma S107 indoor heli for about 3 months now, I have to say that it is one of the most under-rated RC heli out there, hands down. Shop around. 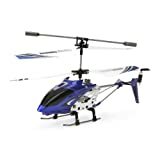 At about $30 online with taxes and stuff, this little trooper delivers the looks, detail, durability and performance of a much pricier heli. The Syma S107 has only 3-way controls but it competes surprisingly well with the likes of the Blade MCX2 which has 4-way controls and retails for about $150 off-line. UPLIFTING LIFT: There is nothing like the sound of the Syma S107 blades when you turn it on. The rush of sound from its four independently articulated blades sound like no other heli I have flown. There is something breezily uplifting about that sound – something elevating about the way it elevates and stays aloft with truly amazing balance. BUILD & DURABILITY: The detail and solid feel of the Syma S107 leaves the Blade MCX2 in the dust. The trim metal body and snug plastic hood fits way better than the loosey-goosey hood on the Blade MCX2. And after many trial crashes the Syma S107 has not shown much damage with the possible exception of a little whirring sound from the tail blade assembly and some herky-jerky movement when I am trying to turn the heli left or right. (I have oiled it a little but all to no avail.) The Blade MCX2 flew well for a couple of months until it would not take off after one unspectacular crash. (I am not making this up.) When I took it into Hobbytown USA in Fremont CA for one of their RC technician to look at, he found out that one of the central plastic gears was not engaging because the engine moving it had been pocked out of position inspite of being “protected” by the plastic hood. My suspicion is that it was probably poked out of position by some protruding prong during that last crash. I was mortified by the prospect of junking something I had paid $150 for only 2 months prior. But to Hobbytown USA’s credit, they replaced the unit without fuss or muss. I was so thankful that they will probably have me as a customer for life. NAVIGATION LIGHT: Finally nobody places the navigational-bling-bling lights better than Syma. That blinking light in the helicopter’s nose makes it look positively sentient when it is hovering in front of you. I love this little heli and wish I had more time to fly it. A higher capacity/quick charge battery would go a long way towards realizing this goal. The current heli only gives 10 minutes of flight time on top of about 45 minutes charge time. But in all fairness this seems to be the case with most RC helis in this category. However the battery’s tendency to lose capacity when overcharged or re-charged without requisite cooling between flights (15 to 30 minutes)really needs to be fixed. Until that time, SYMA should make instructions to that effect front and center of its operating manual. IC circuitry (smart battery tech) would go a long way towards solving problems in this area. 1. Buy 2 or 4 helis for starters as that will give you between 20 to 40 minutes of flying time, total. 2. When your heli’s power gets depleted, do not charge it immediately as the engine assembly is all “hot and bothered”. Let it cool down for about 20 minutes before hooking it up to the charging port. 3. DO NOT OVERCHARGE THE HELI. It will not give you any more power if you do. Au contraire you will end up depleting the charging capacity of your battery because of the dumb circuitry they put in there. The Syma S107 is so easy to control that on my first flight I had it tour my whole apartment, zooming in and out of closets and never touching an obstacle until I deliberately landed it. If you’ve never flown a good RC heli before, you might need to practice a bit. It might be your second or third flight before you get that good. The S107 is *really* that easy to control. I’m sure that many of you have played with Air Hogs and other micro helis and you long for a little heli that just plain flies where you want it to fly and stays up in the air. I’m here to tell you that such perfection is within your grasp. Before I got my S107, I already owned two Syma S105s and I never get tired of flying them. They look almost identical to the S107 and the remote is identical, but they take a little bit of skill to fly with precision and I’ve made little tweaks here and there to get better control. The S107 takes almost no skill to fly. They gyro makes it laughably easy to control. Just use it indoors, get it about 4 feet off the ground so that ground-effects don’t mess with it, fly it a decent distance from air conditioning vents and the thing moves like it’s hanging from a string on a stick. That perfection is, perhaps, its one big flaw. The thing is, I think the S105 is a bit more fun to play with. The S105 needs careful trimming at the beginning of each flight. The S105 tends to make broad turns, but pulls out sharply, risking blade-strikes, unexpected changes in direction and the occasional crash. It’s incredibly easy to fly the S105, but even so every time that I fly one I grow more skillful with it. I made one little change to my S107, taping a paperclip to the front to help it move forward more easily. That’s the sum of all modifications that I made to mine. I can’t find anything else to tweak. That’s awesome. It’s amazing. It’s a fun thing to play with and the feeling of exhilaration endures even after many flights. I heartily recommend this heli. …But if you want a similar heli that’s similarly amazing yet introduces a smidgen of challenge to each flight, consider the S105 as well.